Blizzard Rest is a giant camp approximately halfway between Dawnstar and Whiterun. The camp is a short distance from the road that runs between Dawnstar and Whiterun. 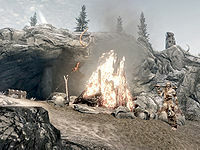 If you have Hearthfire installed then the camp is just to the east of Heljarchen Hall on the southern edge of the Pale. There are two giants and two mammoths found at this camp. The camp is on a ledge with a rock overhang above, while the mammoths are normally found below the ledge. There are the typical painted stones and mammoth bones surrounding the camp. The fire has a ring of rocks circling it. Two charred skeevers are on stakes cooking over the fire. A few paces to the southwest of the fire is an expert-locked chest under the overhang and to the south are three large mammoth cheese bowls. The first giant is found around the fire, while the second giant is typically a short distance east and next to a dead mammoth. However, the second giant is sometimes found roaming the tundra south of the camp. This page was last modified on 10 November 2014, at 01:00.